Around April the grass tennis courts would open for the season. Tennis rackets, locked in their presses for the winter would be pulled out of storage, the strings checked for tension and men, women and boys and girls would start to smash their Slazenger tennis balls across the net. The photo above shows the courts between that square bounded by Osborne Street, western Road and Cambridge Street. Today there are hard courts but the courts for many years were grass. Because of the slope the lower courts were less well-drained and were not preferred. The slope of course gave the advantage to anybody serving from the south but this equalled out over the course of the match. There were tennis courts apparently on Stacey Avenue. I never saw these nor could describe them. 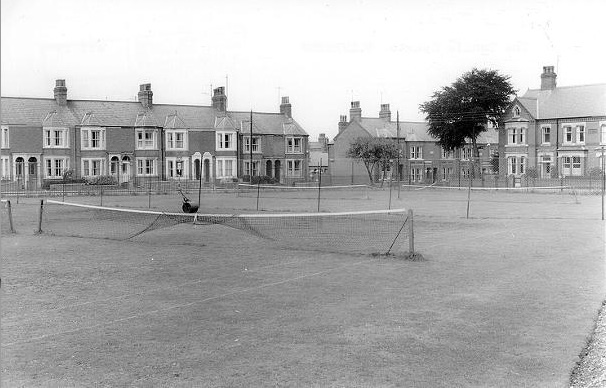 At Wolverton Park they had hard courts which could be used all year round in theory. The Osborne Street courts seemed to be the premier grass courts and I think it is true to say that the better tennis players preferred to play here. The back of the old cricket pavilion was used as a stand to watch games at the centre court and an old railway carriage with an addition was used as a bar and club room. I started playing tennis on these courts in the mid-1950s. Rackets were made of laminated wood and were very heavy. I found my father’s racket too heavy and preferred to use my mother’s which was two ounces lighter. even so, they were very weighty by today’s standards. They also had a tendency to warp because of uneven string tension and had to be kept in a wooden press when not being used. 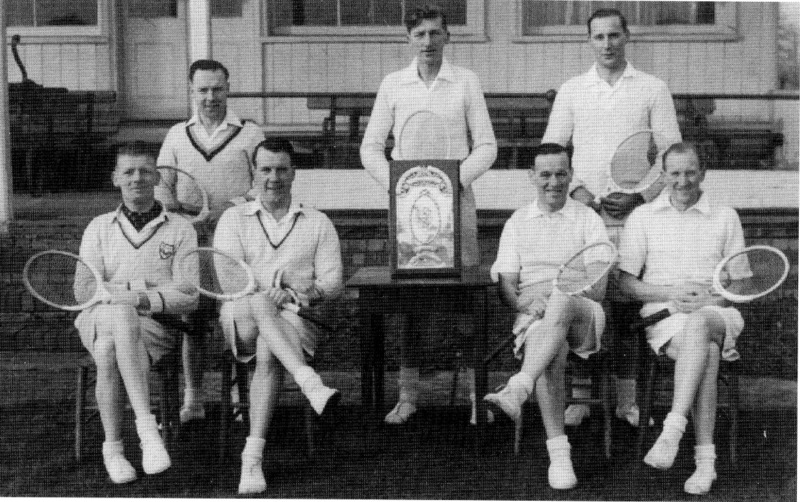 Here is a photo of some of the senior club players from the period. I think they won the Bucks Shield in 1952.